With the company on its last legs in 1961, new Studebaker president Sherwood H. Egbert called on Raymond Loewy (1893-1986) in desperation to design an innovative sports car. Loewy had worked with Studebaker since 1936, designing, with Virgil Exner (1909-1973) and Clair Hodgeman (1911-1992), the lightweight 1939 Champion, the highly successful 1947 postwar models (with Exner), and, with Robert E. Bourke (1916-1996), the acclaimed 1953 hard-top Starliner and Starlight coupes. Demanding (and getting) complete freedom of design, Loewy retreated to Palm Springs with designers Bob Andrews, Tom Kellogg, and John Epstein, working feverishly for 40 days to complete the design, which Loewy named the Avanti. The sleek fiberglass body was put onto a Lark frame, and demonstrated outstanding speed performance on the track. Upon introduction in 1962, the public was so excited that demand immediately exceeded production capacity and many sales were lost. In 1963, Studebaker folded, but Avanti tools and production line were purchased and salvaged by Nathan Altman and Leo Newman. 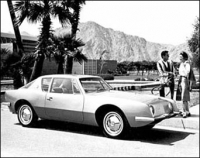 who formed the Avanti Motor Corporation. In 1965, they produced 45 Avanti IIs privately in South Bend, selling them for $6500. Production was low, but by the time of Altman's death in 1976, had increased to 150 cars a year. The company was purchased in 1982 by Stephen Blake, who added a convertible to the line in 1985 but a paint-peeling problem forced the company into Chapter 11. It was sold in 1986 to Mike Kelley and John Cafaro, who moved production facilities to Youngstown, OH in 1987. In 1990, all but a handful of employees were laid off. Increasing governmental regulations were simply too much for such a small company, and in 1991, the Avanti quietly died after nearly 30 years on the scene.